I have a confession to make. It probably seems like I live and breathe to cook, right? It probably seems like I never get tired of stirring and whisking and chopping, like I go to sleep at night spooning the refrigerator and wake up each morning to find a skillet under my pillow and a rainbow arcing gently, benevolently, over the stove. But the truth is, there are many days when I would rather do anything than cook. ANYTHING. Like, hit-myself-over-the-head-with-the-aforementioned-skillet anything. Anything. Lately, I’ve been having a lot of those days. At first, I thought it was because of my recent run of bad recipes. It’s hard to feel terribly excited about spending time in the kitchen after you’ve botched a number of meals in a row. Remember that Great White song, “Once Bitten, Twice Shy?” I sort of feel like that. I am also so overdue for a haircut that I’m starting to look like the lead singer in that video. This can’t lead anywhere good, I fear, especially because I don’t have a pair of leather chaps to complete the look. But really, I think my problem is even bigger than that. I think my problem is peanut butter. I lose all motivation when there is a jar of peanut butter around. Given an adequate supply of sandwich bread, I will eat peanut butter and jelly sandwiches indefinitely, to the near-complete exclusion of other foods. I might bake something sweet now and then – the occasional cookie or cake, maybe – but otherwise, it’s all peanut butter, all the time. I know this because it’s what my life has been like for approximately a month. I am a sick, sick woman. Now you know. But Brandon, bless his optimistic heart, apparently believes that I am still capable of redemption, because he staged an intervention last week. He told me, quite simply, that I had to stop buying sandwich bread. I nodded solemnly. Not long after, I successfully made a salad. And yesterday, I made soup, a puréed broccoli soup with a lemony, chive-spiked sour cream to spoon on top. I feel better already. Good enough, even, to foresee another batch in my near future. And after that, I might get my hair cut. The soup in question is something that I had once intended to include in the book, but I worried that it sounded too boring. I don’t know. Broccoli soup isn’t an easy sell. I had a friend try the recipe, and she loved it – so much so, she reported, that she had to stop herself from eating the lemon-chive sour cream by the spoonful – but still, I was worried. So I yanked it. I moved on. I made other soups, and I sort of forgot about it. But the other day, while leafing through some photographs from a couple of years ago, I found a shot of this soup, and I realized that I missed it. So yesterday, I made it again, and now I don’t know why I ever doubted it. It was delicious. It’s a pretty quick, simple soup, as these things go. 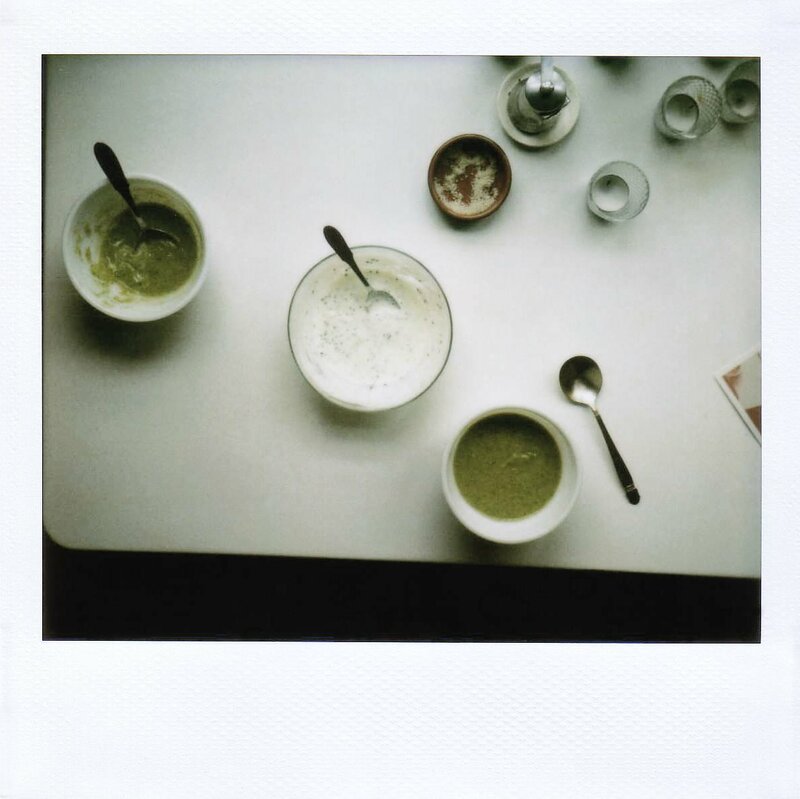 It was inspired by a couple of different recipes: one that I read somewhere for a fairly basic broccoli soup, and one that Brandon found in college, a recipe for a puréed broccoli soup with leek, served with an herbed sour cream. He tells me, incidentally, that it was the first soup he ever puréed. I don’t know how he remembers this kind of stuff. Obviously, the part of my brain that was made to store such things is filled with song lyrics by Great White. Our joint version starts with some onion and leek and garlic softening in a pot, and then into that goes a decent amount of chopped broccoli, some stock, and the rind from a small piece of Parmesan cheese. It all simmers together for about twenty minutes, during which time you slice some scallions and chives and zest a small lemon. Then you take out a small bowl and stir the scallions and chives and lemon zest into some sour cream, along with a little lemon juice, grated Parmesan, and garlic. By this point, the broccoli should be tender, and the cheese rind should be soft and sticky, and the whole pot should smell fantastic, very savory and fragrant with Parmesan. You pull out the rind, purée the soup, stir in some of the sour cream mixture, and then you serve it with another spoonful of sour cream on top. It’s both mellow and bright, light and rich, soothing in parts and punchy in others, and, I think, ideal lunch material. It’s not peanut butter, but I almost don’t mind. I like this “cream” best when made with sour cream, but I’ve also used plain whole-milk yogurt, and it’s very good that way too. If you do use yogurt, keep in mind that it has less fat than sour cream, so you’ll probably need to add some olive oil to balance the acidity of the lemon. (Or just use less lemon!) I also found that the yogurt-based “cream” needed a pinch of sugar to balance it. Oh, and should you have some of the sour cream mixture left over, it makes a great dip for potato chips. In a small stockpot or Dutch oven, warm the butter and oil over medium heat. Add the leeks and onion, and cook, stirring occasionally, until they have softened and the onion is translucent, about 10 minutes. Add the garlic, and cook for one minute. Add the broccoli, stock, Parmesan rind, and salt, and stir to mix. Bring to a boil, reduce to a simmer, and cook, partially covered, until the broccoli is tender, about 20 minutes. While the soup cooks, prepare the cream. In a medium bowl, stir together the sour cream, scallions, chives, lemon zest, lemon juice, grated Parmesan, salt, and garlic, mixing until fully combined. Taste, and adjust as necessary. To finish the soup, remove the Parmesan rind. Using a blender and working in small batches – when puréeing hot liquids, never fill the blender more than one-third full – purée until very smooth. (Alternatively, purée it in the pot with an immersion blender.) Return the soup to the pot, add a few dollops of the cream mixture – I add about 1/3 cup – and stir to incorporate. Taste for seasoning, and adjust as necessary. If needed, rewarm the soup gently over low heat. Serve the soup with a spoonful or two of the remaining cream on top.